I'm going to be open and honest with you. Thanksgiving dinner is one of my favorite meals of the year. I mean, I love other holidays, but when it comes to the act of actually eating, the Thanksgiving meal is king. Sure, Halloween has its candy, Easter has some great delicacies of its own, and St. Patrick's Day food is really underrated, but Thanksgiving is where the culinary magic happens. In my family, we always deep fry our turkey and serve an abundance of pies. It's making me hungry just thinking about that cranberry sauce. However, the sweet potatoes could really just disappear forever and they would never be missed. I have seriously tasted every sweet potato dish imaginable and I am done with that vile root. But let's stay positive, okay? I also believe that the day after Thanksgiving is the best day-after-a-holiday all year long. Why? You open up the fridge and all of that beautiful food is still right there. 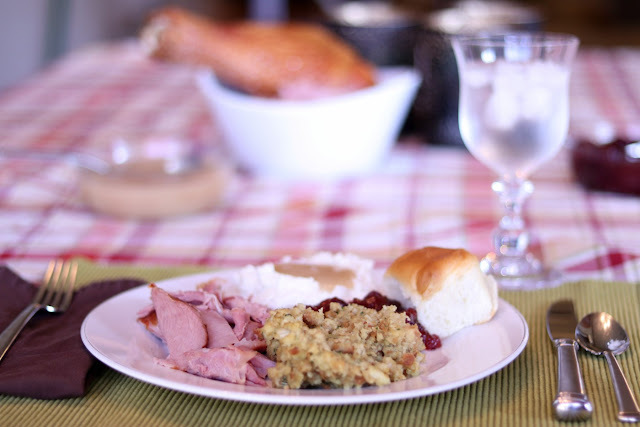 Because if you didn't make enough food for leftovers, you did Thanksgiving wrong. The thing is, after that first day it helps to mix things up a bit. That's why we decided to bust out the waffle iron. Because if something is good on its own, it will be next level if you waffle it. And guess what was pretty much created for waffling? That's right, Thanksgiving stuffing! The amazing thing is that molding stuffing into waffle form, and combining it with the powers of the other leftovers, makes this recipe the perfect dish to send to school or work in a Pyrex storage container with the person that you love. The directions for our new Thanksgiving Leftovers Waffle Sandwich are below, but take a minute to check out how it all fits together like a puzzle in the Pyrex limited-edition storage dish. Also, the rubber top keeps it fresh and is a fantastic surface to attach a loving note to for that special person in your life. 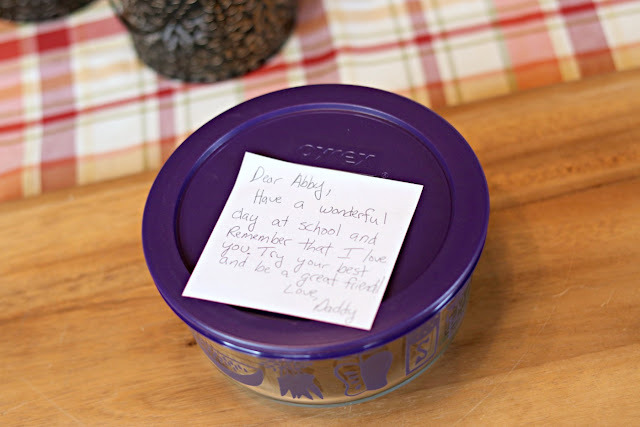 Just take out a pad of sticky notes, think of some encouraging words, and leave it on the lid for your kids or spouse to find. It's about sending the love on the outside, to accompany the food on the inside! My kids really appreciate the notes that we send in their lunch, even if they sometimes pretend like it embarrasses them. It just takes a few extra moments to share the love. So while you are eagerly stuffing leftovers into the Pyrex mixing bowl, and your mouth, do a little extra and write out a short note as well. Just leave the sweet potatoes out of it. Because no one needs that kind of negativity in their lunch. 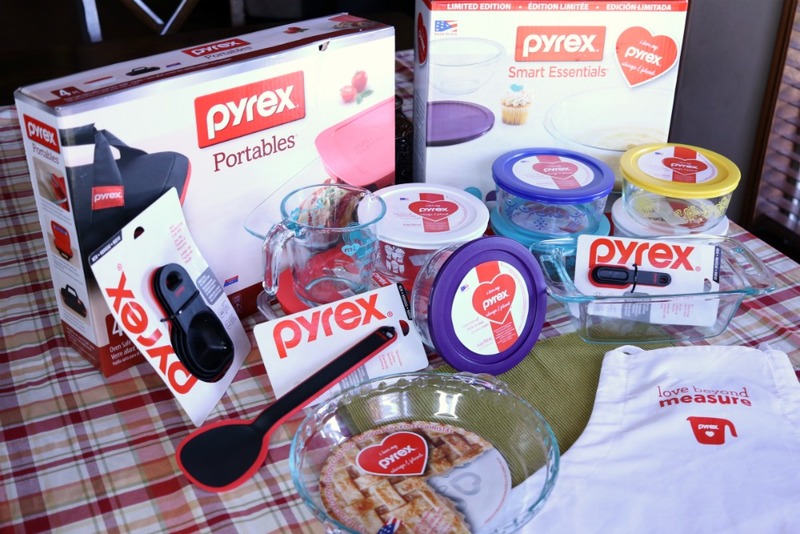 Thankfully Pyrex is giving one of you readers a humungous prize pack to help you get a jump start on this. When it comes to the recipe, you can easily make it with love, and share it with Pyrex. Just enter using the widget below. When my wife and I were first married, we received a Pyrex set as a wedding gift. One day, we left a dish over at someone's house and could never get it back. My wife was so distraught that she had to reorder that exact dish because it was so useful. That's how much we love this stuff. Take a look at all the cooking containers in fun patterns, and tools that one lucky reader will receive! Even if you don't win head over to www.pyrexware.com right now and see all of the Love limited-edition kitchen tools that they have available in their store. Start with entering my giveaway below, continue with writing a short lunch note, and finish with a fantastic waffle sandwich recipe! Trust me, if your family is anything like mine, they will devour it. 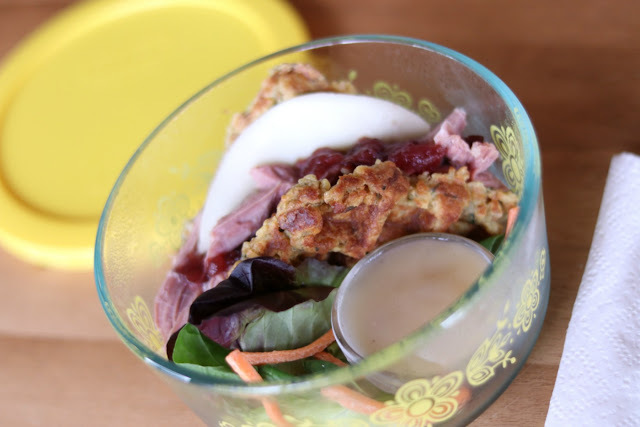 Ingredients: All the Thanksgiving leftovers! Okay really just stuffing, eggs, turkey pieces, sliced cheese, mixed greens, cranberry sauce, gravy. 1. Heat waffle iron. Mix leftover stuffing with two eggs. 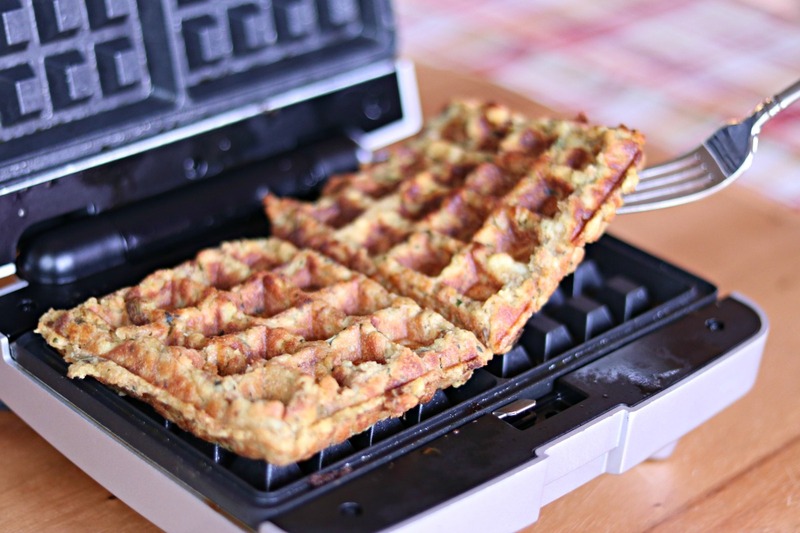 Press into waffle iron and cook for about fifteen minutes or until crispy. You will want to make two waffles per person. Remove and cool slightly. 2. Pile turkey, cheese, and cranberry sauce onto one waffle. Top with second waffle. 3. Cut in half and place in Pyrex dish. Surround with mixed greens. These can be put on when the person is ready to eat. 4. Pour gravy into a small dish. Cover and place next to sandwich in Pyrex container. This will need to be reheated when ready to eat. Once heated, gravy can be poured onto sandwich or used as a dipping sauce. 5. Cover Pyrex container with rubber lid. Write a short note telling the person how much you love and appreciate them and stick it on the lid. 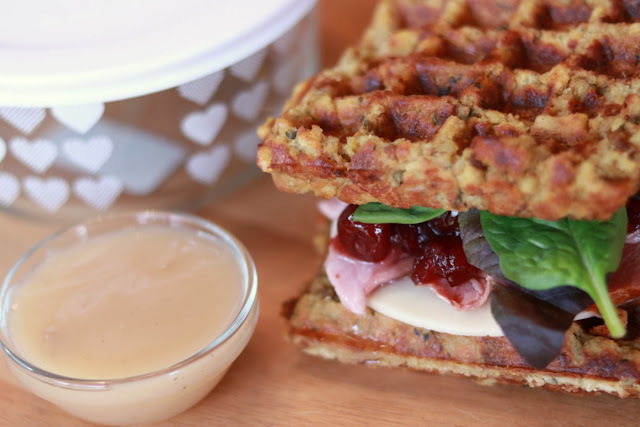 Your Thanksgiving Leftovers Waffle Sandwich is ready to go! HAHAH! You are so right about Thanksgiving, its a favorite holiday around our house as well. Now i will have to reconsider how many turkeys I will make so we can have leftovers, i know i would love to try a Thanksgiving leftovers waffle sandwich.. yummy! thanks for the giveaway. Happy Thanksgiving! Can't wait to try this. Love the idea of Stuffing waffles.